David Thodal worked at Gulf of Maine Books the first year we were open, 1979, keeping the store open on Friday nights, filling in at other times, and becoming a regular member of the Bums Academy.For a number of years now he has been living in Montana, with his wife and daughter. 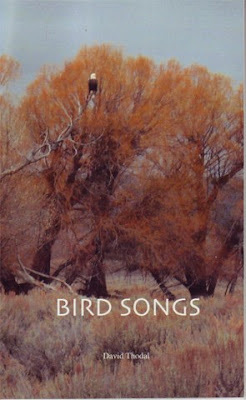 He has just published a collection of poems called "Bird Songs", saying that "I am thinking...of the bird song as an exclamation of home, "this must be the place". These poems are my song of place." Last Sunday the Boston Globe had a piece called Seven Shops For Book Lovers, by Jonathan Levitt. Our store was one of the seven, and here is what the piece said:"From their sunny storefront just down the hill from Bowdoin College, poet Gary Lawless and his wife, Beth Leonard, run Gulf of Maine Books. Since 1979 they have devoted themselves to the bookselling life. Lawless is editor at Blackberry Books, a publisher of out-of-print Maine classics and poetry. In the store's early days Leonard worked at the local Post Office and Lawless worked nights in the warehouse at L L Bean. These days they make a living offering books difficult to find in mainstream bookstores: a mix of small press poetry, obscure regional titles, alternative politics, and social justice. "All of the usual left liberal causes are well represented here - and the right wing not at all," says Leonard,"We don't feel any obligation to be fair and balanced in that way."